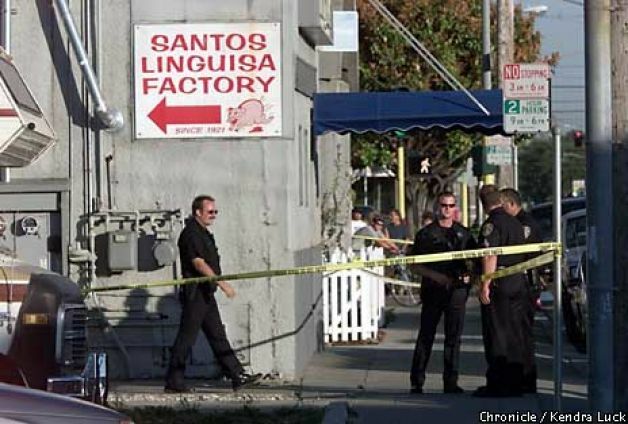 San Leandro Police and FBI agents investigating the murders at the Santos Linguisa Factory. San Francisco Chronicle photo. Stuart Alexander, candidate for mayor of San Leandro. Photo by Tom Gallagher for the Hayward Review via the Associated Press. 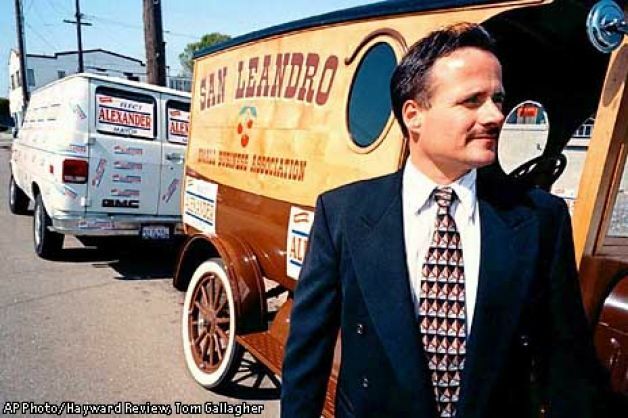 On June 21, 2000, at the San Leandro Santos Linguisa Factory, sausage-maker Stuart Alexander gunned down three meat inspectors in cold blood. He was angry that they were demanding safe standards in his sausage production. Fourteen years later, the murderer and his crimes are the subject of Brian Copeland’s latest play, The Scion. It’s a remarkable story —75 gripping, moving, and often wildly funny minutes put together by a master performer and writer. Copeland has been mining his personal experience, contemporary culture, and history throughout his career as a playwright, author, KGO radio show host, and commentator. His first play, Not a Genuine Black Man, tells the story of African-American Copeland and his family moving to lily-white San Leandro in 1972. It exhibits his unique blend of laugh-out-loud hilarity and gut-wrenching poignancy and made history as the longest-running solo play in San Francisco. Ten years later, it has played in more than 30 cities across America and is currently playing at the renowned Berkeley Repertory Theater. Copeland’s new play is his first that doesn’t tell a personal story. Stuart Alexander’s triple homicide shocked the city and the nation, and Copeland wanted to get the story behind the headlines. In The Scion, Copeland brings his razor-sharp wit to themes of justice, privilege, and regulation in America as he tells the story of how Alexander got away with increasingly violent outbursts and brushes with the law, leading up to his deadly encounter with the inspectors who came to try yet again to ensure the safety of his sausage production. “Rules are rules,” Copeland says, “for everybody.” And yet, in every community in the world, there is always someone who seems to get away with breaking the rules. Although The Scion’s story is dark and dramatic, Copeland uses comedy and razor-sharp wit to deliver his provocative points, pulling in current events to bring home the universality of the power of privilege—and to provide moments of laugh-out-loud hilarity. The Scion recently played for a few months to sold-out audiences and critical acclaim at the Marsh Theater in San Francisco. That run has ended, and now there is only one performance scheduled, a benefit performance for the San Leandro Historical Society on Sunday, May 18, at 7:00 p.m. This East Bay Premiere of The Scion is at San Leandro High School’s beautiful Performing Arts Center. Proceeds from this production will help restore the Little Brown Church, one of the oldest buildings in San Leandro. Last year, a generous grant from the Questers restored the stained-glass windows. This year, the Historical Society hopes to remove the peeling, lead-based paint from the old-growth redwood exterior. The San Leandro Historical Society is grateful for Mr. Copeland’s offer to do this benefit performance. The extraordinary generosity of sponsor OSIsoft, along with donors Chad and Jean Pennebaker; Furtado, Jaspovice & Simons; and Dublin Iceland have made it possible to bring this local story home to San Leandro. Thank you to our sponsors, donors, and the 300 people who attended this extraordinary performance in May, 2014.